Why I forsook the router today! As I learn more, and become more aware of how I work, my garage/shop has evolved a bit even in just the 2 months since I last took pics. The photo above was taken standing at the garage door looking in. I've numbered the highlights and will list below. I picked them up in exchange for a Harbor Freight wire feed welder and $100 in cash. So, essentially, $200. The table surfaces were badly rusted, but the paint and interiors were awesome. The only rust inside is a little streak that came down from the saw blade opening in the top and what looks like a spill down one side of the stand. I resurfaced the tops, cleaned and lubed all moving parts, put new belts on, and started using them! 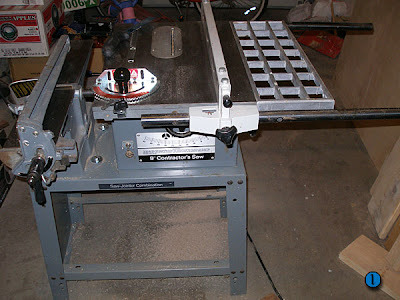 The only thing left to do is replace the jointer blades. Or at least resharpen them. The fence is the original fence that came with the tool. It's a decent fence, much better than the one on the Black & Decker. The miter gauge, however, is nowhere near original. I just bought it last week. It's an Incra v27 that cost me $42.50 at Rockler. It was on sale for $49.99 and I had a 15% off coupon! Probably the best deal in woodworking! It is amazing to use. I built this table to house my Harbor Freight Trim Router that goes on sale for $20 or less frequently. It's a great little tool and I wanted to use it in a table too. The table is built of particleboard, melamine, pine trim, and Rockler T-Track. It hangs from a cleat mounted on the wall, keeping it out of my way when not in use. 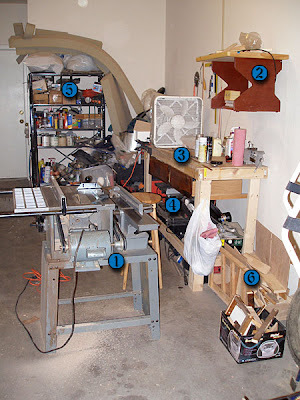 Probably the most important thing you can build, a workbench is the heart of any shop. Knowing I needed a workbench, but not knowing what I needed *in* a workbench, I built this very simple table from 2x4's and OSD. I later added some glides for drawers recovered from a trashed waterbed. Mine is taller than most, allowing comfortable work whether standing or sitting on the stool. I don't do much assembly on the bench, instead using the little table I picked up from Harbor Freight a while back. Note the filter mounted to a box fan. That makes a huge difference in how much crap I breathe when working on wood, and also helps prevent dust boogers from affecting freshly finished pieces. In the drawers are sandpaper, small measuring tools, cutting tools, abrasive tools, drilling tools, screwdrivers, etc. Hanging from the wall above are currently table saw blades, coping and hack saw, framing squares, and arbor wrenches. Setting on top of the bench normally are a shop box holding glue, lube, spring clamps, and some small scraps. 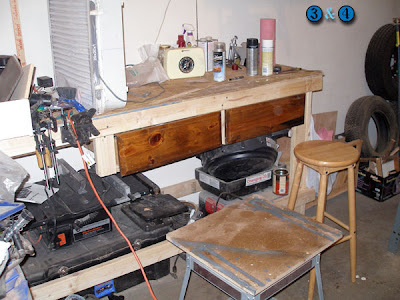 At the other end are a vise, radio, and power strip. The fan sets there until I go to use it, then it's on the small table or the stool. The other stuff you see are finishes I was using. One of these days I'll put a shelf under the bench. But currently there's a large plastic storage box with auto stuff, my old benchmount table saw, Craftsman/Dremel scroll saw, handheld circular saw, palm sander, oil change bins, scrap metal, and whatever else I toss under there. The back of the "shop" has a tall metal shelving unit. I picked that up at a thrift store a couple years ago for $15. All my finishes, paints, chemicals, and small auto supplies are on the shelves. Up on top are large pieces of high density foam for upholstering the seats in the Guacamole Bus and some fabric scraps in trash bags. I also have a few small clamps stuck to the sides. This is something I just finished, and think is pretty cool. Using scrap 1x2" rough pine from the same waterbed mentioned above and a sheet of 1/4" ply, I screwed this box together. Underneath are a set of casters from Ikea years ago for another project that never happened. 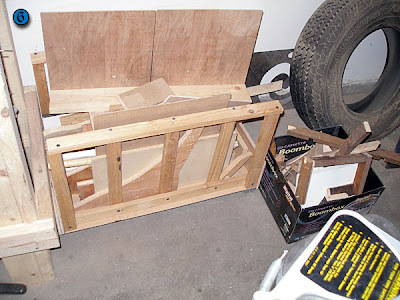 The little cardboard box next to it holds the pieces that need to be thrown away.